After Cuban cigars, it’s commercial flights between the United States and Cuba which are staging a come-back. After a 55-year embargo, eight airlines got permission to fly to Cuba and JetBlue was the first airline to land in the once forbidden land. 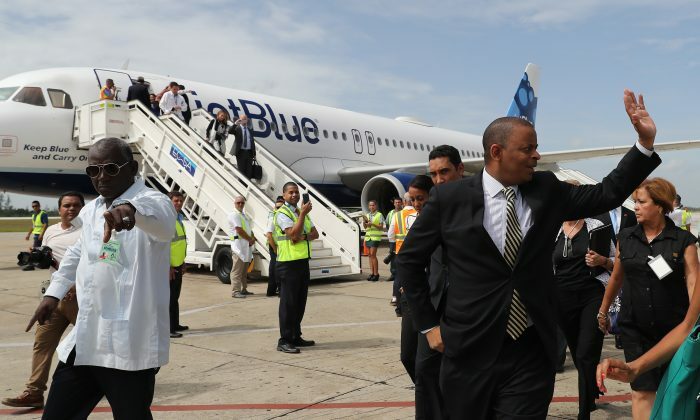 A JetBlue flight with 150 passengers took off from Fort Lauderdale and landed at Abel Santamaría Airport in Santa Clara city on Aug. 31. This marked the first U.S. scheduled commercial flight since 1961. JetBlue now flies three times a week from Fort Lauderdale to Santa Clara. The commercial airline service started a year after the United States and Cuba restored diplomatic ties. “For the first time in decades, families separated by only a short stretch of water can easily and affordably visit a loved one, attend an important occasion or visit a special place–and the role we play speaks directly to our mission of inspiring humanity,” said Robin Hayes, president and chief executive officer of JetBlue. The island, which is 90 miles off the Florida coast requires visitors to obtain an entrance visa. However, Americans still cannot visit Cuba for a beach holiday. For the first time in decades, families separated by only a short stretch of water can easily and affordably visit a loved one. Traveling to Cuba for tourism is prohibited under U.S. law for U.S. citizens and permanent residents. To visit, travelers must have one of 12 reasons listed by the government. These include family visits, official business or government trips, journalistic, educational, religious, and humanitarian activities and certain trade-related duties, but not tourism. Cruise companies and U.S. hospitality chains like Starwood, and Marriott also announced their interests to expand in Cuba. Starwood signed three deals in Cuba’s capital Havana and Marriott got the green light from the U.S. government to develop a business in Cuba, according to press releases from both companies in March. Even Airbnb launched a house-sharing service in Cuba last year. Despite many challenges, including the lack of internet and payments system (American bank ATM and credit cards do not work in Cuba), Airbnb has managed to grow its business on the island. The company served 13,000 customers in 4,000 houses across 40 cities in its first year in Cuba, according to Fortune magazine. Despite the ban on tourism, the normalization of relations with Cuba and the commercial flights to the island should increase the number of American visitors. Authorized charter flights between the United States and Cuba were already available under certain conditions, since the mid-1970s. In 2014, 91,000 people traveled from the United States to Cuba and that number increased to 150,000 in 2015, according to the Council on Foreign Relations. If all travel restrictions were lifted, Cuban officials think 1.5 million Americans could visit the island each year, the World Bank states in a report. “Ten years from now, Cuba will be among the most popular destinations in the world,” Peter Sanchez told Cigar Aficionado. Sanchez is the founder and chief executive officer of Cuba Tours and Travel. But Cuba is not ready for the influx of tourists, according to experts. Issues like infrastructure and a limited number of hotel rooms have to be resolved to accommodate the surging number of visitors. There are only 63,000 hotel rooms in Cuba. The airlines are flying ahead anyway. Silver Airways started its commercial flight service to Santa Clara on Sept. 1 and became the number two after JetBlue. American Airlines is also starting commercial routes to five cities in Cuba, starting Sept. 7. The U.S. Department of Transportation gave approval for eight airlines to fly to Cuba including Alaska Airlines, American Airlines, Delta Air Lines, Frontier Airlines, JetBlue Airways, Southwest Airlines, Spirit Airlines, and United Airlines. Twelve airlines had submitted requests. For now, 20 daily flight routes will be available under an arrangement between both governments. In the next few months, Americans will be able to fly directly to nine Cuban cities from Miami, Fort Lauderdale, Chicago, Philadelphia, and Minneapolis as well as to Havana from Atlanta, New York, Los Angeles, and Houston. According to a survey by Switchfly, a travel e-commerce platform, 37 percent of Americans expressed their interest in visiting Cuba, with the majority of interest coming from the younger generation. Around 50 percent of students and millennials would like to visit Cuba.